"Jaws" wins title for fourth consecutive year; Takeru "Tsunami" Kobayashi arrested! 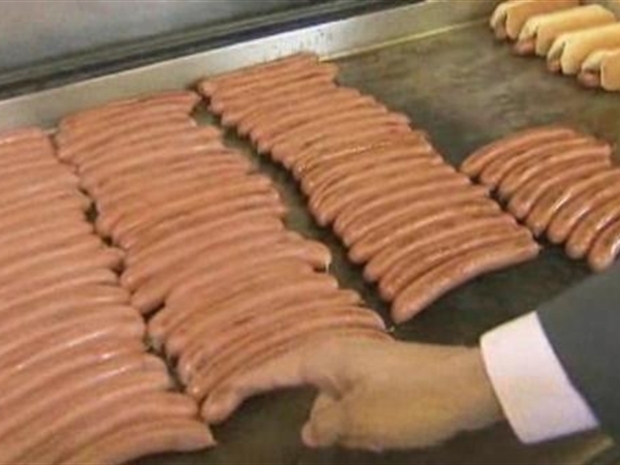 Every Fourth of July, Coney Island stages an event featuring two of America's biggest loves: hot dogs and competition. 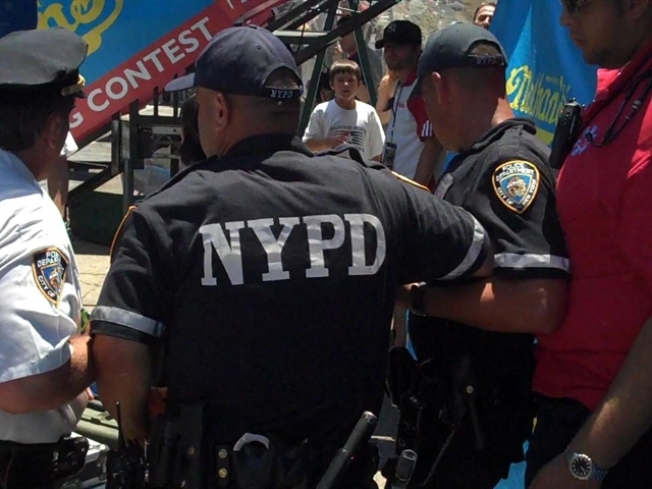 The two pastimes merged Sunday afternoon by the Brooklyn boardwalk for the annual Nathan's Famous Fourth of July International Hot Dog Eating Contest. But as if the spectacle of grown men and women stuffing as many hot dogs as possible into their mouths wasn't strange enough, this year's event was made more surreal by former champion Takeru "The Tsunami" Kobayashi's bizarre arrest after the competition was over. For the fourth year in a row the gustatory gauntlet was won by defending champion, 26-year-old Californian Joey "Jaws" Chestnut, who ate 54 wieners and buns in 10 minutes. He does something nobody else can do -- or perhaps it's something nobody else has the desire to do. Now, Joey Chestnut is training to break his own hot dog eating record. Tom Llamas reports. The 230-pound-man took home the bejeweled, mustard-yellow belt plus a $20,000 purse. He didn't break the record of 69 hot dogs, but had such a comfortable lead over the competition with four minutes left that he seemed to slow down near the end. Tim "Eater X" Janus came in second with 45 hot dogs consumed, and Pat Bertoletti rounded out third with 37. "I actually stopped drinking water today, so I was a little bit dehydrated going into the contest, but it's alright, I beat the competition today, if anybody else was here I would have beat them too," said Chestnut, his last comment a veiled reference to 6-time champion Kobayashi -- who was in the crowd amassed on Surf and Stillwell Avenues in Brooklyn. "If he was a real man he would have been on the stage, there's no reason for him not to be here," said Chestnut. Perhaps reacting to that, Kobayashi rushed the stage after the competition. Police officers grabbed him, and he tried to hold onto police barricades as they took him into custody. Finally, they dragged him down the stairs, with Kobayashi resisting vehemently. As he was lead away, some in the crowd chanted "Free Kobi!" and Takeru was even wearing a black shirt that said the same in green letters. "Let him eat! Let him eat!" others in the crowd chanted as police handcuffed him. "There's a contract dispute, so they weren't giving him his freedom," said Kobayashi's interpreter, Maggie James. Kobayashi, The world's No. 3 professional eater had refused to sign a contract with Major League Eating — the fast food equivalent of the NFL — to be free to compete in contests sanctioned by other groups, said George Shea, host of the Coney Island event televised live on ESPN. "It's like Tom Brady saying he wants to be in the Super Bowl, but then wanting to go compete in Arena football," Shea said before the competition. The way Shea sees it, a hot dog-eating contest and America's biggest city were made for each other: "New York is a jewel built on the dream of greatness, and that same dream is driving every competitive eater."